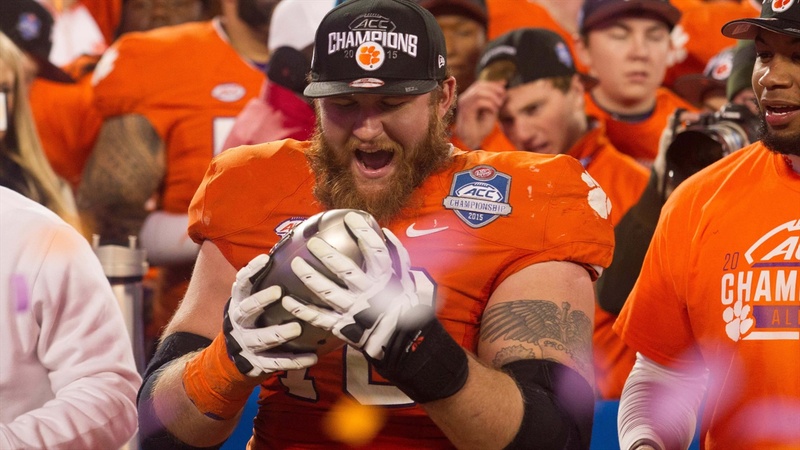 Clemson Tigers fans will see former offensive guard, team captain and first-team All-ACC selection Eric Mac Lain on ACC Network (ACCN) Fridays and Saturdays in the fall. He will contribute to studio coverage with analysis of the conference’s season-long football action. ACCN is the new, 24/7 national platform that will launch on August 22, 2019. One week later, Clemson will kick off ACCN’s football slate on August 29 when it hosts Georgia Tech in the season-opening game for both teams. A Hope Mill, N.C., native, Mac Lain played at Clemson 2011-15, where the Tigers captured two conference championships and made a national championship appearance. He obtained the most wins (46) by a single player in Clemson history, while earning Strength and Conditioning All America honors. As a student,Mac Lain was an All-ACC Academic Football Team selection and was graduated with a bachelor’s in health science (2015) and a master’s in athletic leadership and administration (2017). He will be joining ACCN from JMI Sports where he has worked on multimedia sponsorship rights for Clemson athletics. Fans interested in learning more about ACCN can visit www.GetACCN.com. Owned and operated by ESPN in partnership with the Atlantic Coast Conference, ACC Network (ACCN) is a new 24/7 national network dedicated to ACC sports set to launch August 22, 2019. Approximately 450 live contests including 40 regular-season football games, 150 men’s and women’s basketball games, and 200 other regular-season competitions and tournament games from across the conference’s 27 sponsored sports will be televised annually, plus a complement of news and information shows and original programming. Together, the ACCN and its digital platform, ACC Network Extra (ACCNE), will feature 1,300 ACC events in its first year. ESPN has been televising ACC content since 1979 and has exclusive rights to every conference-controlled game across sports and championships.